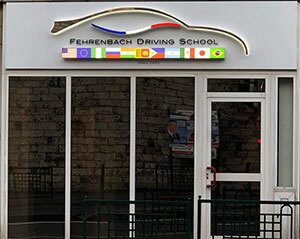 Welcome to the FEHRENBACH DRIVING SCHOOL, where thousands of confident drivers have graduated in the Paris area since 1985. At the FEHRENBACH DRIVING SCHOOL, we offer a course conducted in English designed to prepare a candidate to take both the written test and the driving test. Through individualized instruction you will learn the rules of the road and how to recognize trick questions, thus greatly improving your chances of successfully passing the test in the shortest amount of time. (the minimum requested is 2 months). French law requires foreigners (except europeans ) to have a French driver’s licence to drive in France if they are a resident for more than one year. Without this, they cannot be legally insured. Since the driver’s license test is not only difficult but also conducted in French, this can present a problem for those with little or no knowledge of French or the French driving code. The FEHRENBACH DRIVING SCHOOL also handle all administrative details at the Prefecture on your behalf, relieving you of time-consuming bureaucracy. When you enroll, you will receive a book summarizing the French driving code written in English. At the FEHRENBACH DRIVING SHCOOL you will receive instruction in English using slides showing driving situations wtih corresponding multiple choice questions ( the same system used for the actual written test). You may attend classes as often as you like until you feel confident to take the test. Our flexible class schedule * (day time, evening and Saturday) allows you to select the days and times most convenient for you by simply calling in advance for an appointment. Eight hours of driving practice will be scheduled to prepare you for the driving test. The 2 first hours as soon as you are enrolled to coordinate with your classroom work. And after passing the written test, you will have 2 hours of trial test and then four hours on the official exam circuit just before your driving test. We understand that most foreigners living in PARIS already know how to drive, but the eight hours of practical driving are compulsory to familiarize you with the inspector’s requirements. You may not need to get the French license, for example if you are here as a tourist or if you can exchange your home country license. Our FRENCH HIGHWAY CODE BOOK will be very precious and helpful in boosting your driving confidence.